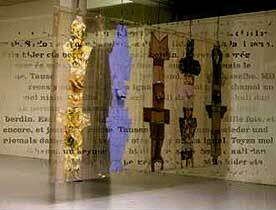 Dissociated bodies 1999 - New York. An installation by gal and G.S. Sedlak. Die Halle, Salzburg. August 1999. "Vernähungen": clothes are cut up and combined in a new way. A new complex and strange context arises. A different point of view becomes possible. "Stimmskulpturen": gal cuts up human speech, the elements are combined and overlapped in new and diverse forms. Speech and clothing, two forms of human communication, are analysed: How can we understand the transition and overlapping of functional and aesthetic perception. Which dimensions of seeing, hearing and thinking are opened to us deconstructing and recombining the material? Combining and confronting both artistic methods in the audio-textile installation the aesthetic and intellectual adventure becomes exciting on an additional level.